Symptoms of heart failure include shortness of breath, a tired feeling all the time, a build-up of fluid in the tissues, and heart palpitations. 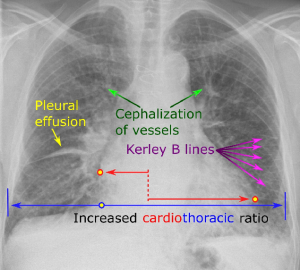 This chest x-ray shows an enlarged heart, the build-up of fluid between the lungs and the chest, the infiltration of fluid into the lungs, and dilated pulmonary blood vessels. Still to come for this heart failure patient is the collecting of more fluid in the lungs, making breathing even more difficult. Heart failure patients treated with daily Coenzyme Q10 supplements in addition to their conventional heart failure medications have significantly lower death rates and significantly improved exercise capacity compared with heart failure patients treated with conventional medications alone [Lei]. This is the conclusion of the 2017 meta-analysis of relevant randomized controlled trials reported by Li Lei and Yan Liu in the BMC Cardiovascular Disorders journal. The two cardiologists analyzed the results from 14 randomized controlled studies enrolling a total of 2149 patients. Earlier meta-analyses of the available research literature have shown reduced death rates and improved heart ejection fraction for heart failure patients taking Coenzyme Q10 supplements [Soja; Sander; Fotino]. This study by Lei and Liu shows that Coenzyme Q10 supplementation can also improve exercise tolerance in patients with heart failure. Mortensen (2014): Dr. Mortensen’s Q-Symbio study, enrolling 420 chronic heart failure patients, showed that long-term Coenzyme Q10 adjuvant treatment is safe, improves symptoms and survival, and reduces the number and frequency of major adverse cardiovascular events. Q-Symbio patients receiving the active Coenzyme Q10 treatment had significantly lower incidence of hospital stays for complications related to heart failure. Alehagen (2015): Professor Alehagen’s KiSel-10 study, enrolling 443 healthy elderly citizens aged 70 – 88 years, showed that four years of supplementation with a high-selenium yeast preparation and Coenzyme Q10 capsules significantly reduces the risk of death from heart disease. Moreover, the protective effect of the supplement combination was not limited to the four-year study period but persisted during the follow-up period for up to ten years. Munkholm (1999): Dr. Munkholm’s short-term study (12 weeks of Coenzyme Q10 supplementation) showed significant patient improvement in several left ventricle heart performance parameters. Morisco (1993): Dr. Morisco’s year-long study of 641 congestive heart failure patients showed that the addition of Coenzyme Q10 to conventional therapy significantly reduces hospitalization for the worsening of heart failure and significantly reduces the incidence of serious complications in patients with chronic heart failure. Note: The effective dosage in these studies was in the range of 150 – 300 milligrams of Coenzyme Q10 daily, taken at meal time in two or three separate doses. The older we get, the greater the risk of developing heart failure, which is the medical term for inadequate pumping action by the heart muscle. One reason for the increased risk of heart failure is the body’s reduced synthesis of Coenzyme Q10. Note, too, that statin medications are known to inhibit the body’s synthesis not only of cholesterol but also of Coenzyme Q10. Studies show that patients taking a statin medication need to talk to their cardiologists about Coenzyme Q10 supplementation [Okuyama]. Simply put, plasma Coenzyme Q10 levels are an independent predictor of death in heart failure patients. Low plasma and tissue concentrations of Coenzyme Q10 connote increased risk of heart failure. We need Coenzyme Q10 supplementation as we grow older [Molyneux]. The heart muscle cells need an adequate supply of Coenzyme Q10 both for the production of ATP energy and for antioxidant protection against oxidative stress. Furthermore, optimal levels of Coenzyme Q10 are associated with improved endothelial function, reducing the risk of atherosclerosis [Rosenfeldt]. Now we have good solid documentation from several clinical trials evaluating Coenzyme Q10 as an adjuvant treatment for chronic heart failure [Lei]. The studies show that Coenzyme Q10 supplementation is effective and is safe and well tolerated [Yang]. A well-formulated Coenzyme Q10 supplement is also affordable. For those of my readers who value scientific documentation as highly as I do, I want to list the earlier major meta-analyses and reviews of the Coenzyme Q10 and heart failure medical literature. It can be seen that Coenzyme Q10 adjuvant treatment of chronic heart failure is no Johnny-come-lately in the bio-medical literature. Soja : Treatment of congestive heart failure with Coenzyme Q10 illuminated by meta-analyses of clinical trials. Rosenfeldt : Systematic review of effect of Coenzyme Q10 in physical exercise, hypertension and heart failure. Sander : The impact of Coenzyme Q10 on systolic function in patients with chronic heart failure. Fotino : Effect of Coenzyme Q10 supplementation on heart failure: a meta-analysis. Madmani : Coenzyme Q10 for heart failure. Sharma : Coenzyme Q10 and Heart Failure: A State-of-the-Art Review. Full references are given below. Alehagen, U., Aaseth, J., & Johansson, P. (2015). Reduced Cardiovascular Mortality 10 Years after Supplementation with Selenium and Coenzyme Q10 for Four Years: Follow-Up Results of a Prospective Randomized Double-Blind Placebo-Controlled Trial in Elderly Citizens. Plos One, 10(12), e0141641. doi:10.1371/journal.pone.0141641. Munkholm H, Hansen HH, Rasmussen K. Coenzyme Q10 treatment in serious heart failure. BioFactors (Oxford, England). 1999;9(2-4):285–9. Rosenfeldt, F., Hilton, D., Pepe, S., & Krum, H. (2003). Systematic review of effect of Coenzyme Q10 in physical exercise, hypertension and heart failure. Biofactors (Oxford, England), 18(1-4), 91-100. The information presented in this review article is not intended as medical advice and should not be construed as such.